[19:02] <~Dan> Sorry for cutting it so close! [19:02] <~Dan> The floor is open to questions! [19:02] <~Dan> What are some of the elements that make Pulp Cthulhu different from standard 1920s CoC? [19:04] <+MikeMason> Pulp is very much about action orientated stories with tough and resourceful heroes against mad villains and crazy schemes, whereas traditional CoC is about average folk caught up in the midst of dark plots. [19:05] <~Dan> How does it differ from the BRP pulp supplement? [19:05] <+MikeMason> Pulp Heroes can go head to head with Mythos monsters which would easily stomp on standard CoC investigators. [19:07] <+MikeMason> It is directly linked to CoC, and the rules dovetail into CoC closely. There’s more player agency. The BRP book is a lot smaller and more general. Pulp Cthulhu has lots of advice, supplemental rules, pulp organisations, loads of material on the 1930s, a history of the actual pulps, and 4 scenarios. [19:08] <+MikeMason> The other key difference, is Pulp introduces Archetypes for player characters. [19:08] <~Dan> Can it be used for “normal” (relatively speaking) adventure pulp action, or is it very much pulp adventure + Cthulhu? [19:10] <+MikeMason> It can be used for traditional scenarios as well – in fact there is guidance on fine tuning the Pulp rules for the kind of game you want – e.g. low pulp (CoC+), mid, and high level pulp. [19:11] <~Dan> Speaking of high level pulp, can it handle what I like to call “proto-supers”, such as the Shadow and Doc Savage? [19:14] <+MikeMason> There’s also insane talents (which you might get it you go insane!) which allow for some weird and bizarre abilities. [19:14] <~Dan> Can you give some examples of insane talents? [19:16] <+MikeMason> insane speed, strength, hard to hit, insane understanding, and skill augmentation – the ability to combine a skill with Cthulhu Mythos knowledge to produce unnatural effects – like reanimating the dead. [19:16] <+MikeMason> those are just a few. [19:16] <~Dan> Wow… So a PC can be Herbert West? [19:18] <~Dan> Does that mean that if you want to be a mad scientist type in Pulp Cthulhu, you have to be literally mad? Or does that just make Weird Science easier? [19:20] <~Dan> How do the archetypes that you mentioned work? [19:24] <~Dan> Speaking of mystic, what sorts of powers are available to PCs? Are there psychic powers? [19:26] <~Dan> Can you Cloud Men’s Minds(TM)? [19:27] <+MikeMason> that would probably fall under the Hypnosis skill – which is further enhanced in Pulp. [19:28] <~Dan> Does magic get any tweaks? [19:30] <~Dan> Is magic still as hazardous? [19:33] <~Dan> How does sanity work? I’m guessing that Pulp Cthulhu heroes don’t go nuts as easily. [19:35] <+MikeMason> You can use Luck points to adjust skill roles, and also reduce Sanity loss. One of the pulp talents also helps to reduce Sanity loss. It’s still Call of Cthulhu at the end of the day – you might be tougher and more capable but insanity can still strike – but now with insane talents you can perhaps do stuff you could never have done before. [19:36] <~Dan> So how much control do PCs retain while insane? Or does insanity simply give access to insane talents, without the PC having to be currently insane? [19:39] <~Dan> It sounds almost like gaining a mutation from radiation exposure in one of the more gonzo post-apocalypse RPGs. [19:41] <~Dan> What sorts of pulpy adversaries do you include in the book? [19:44] <~Dan> Wow… Sounds like the book really does work as a “standard” pulp game, then, based on the adversaries. [19:44] <~Dan> That’s a new one. [19:45] <+MikeMason> It’s is very much a toolkit to allow you to craft the style of game you want – epic pulp to enhanced CoC. [19:48] <+MikeMason> pretty easy – you could either have an augmented Animal Handling skill or create pulp talent that gives you animal affinity or whatever. [19:48] <~Dan> I see… Cool. [19:49] <~Dan> I know it’s an ungodly hour for you, so is there anything we haven’t covered that you’d like to bring up before we let you get some sleep? [19:49] <~Dan> And thanks so much for staying up for this, by the way! [19:49] <+MikeMason> in fact, we have a supers campaign in the works based on Pulp Cthulhu – can say anymore, it’s early days. [19:49] <+MikeMason> no worries – it’s been fun. [19:50] <~Dan> Ooooh, that sounds intriguing. 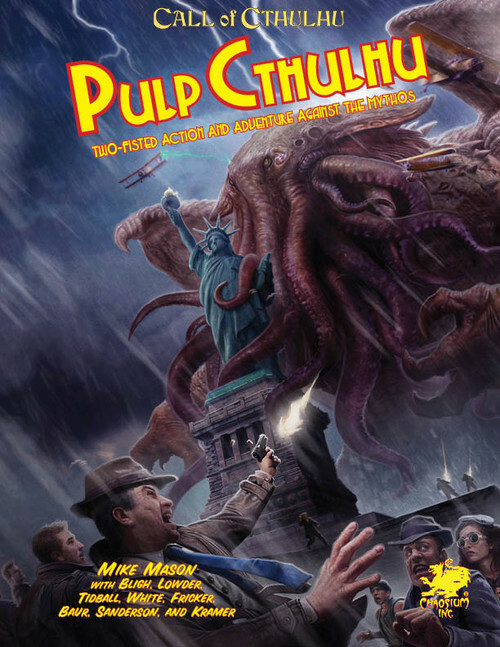 [19:51] <+MikeMason> Pulp Cthulhu is available from the chaosium.com website and will be in stores very soon. If you’ve not tried Call of Cthulhu before – go to the site and you can download free quick-play rules and the solo adventure Alone Against The Flames, which teaches you the rules as you play through. [19:51] <~Dan> Good to know! [19:52] <+MikeMason> Anyway, thanks for having me. Look forward to hearing of your pulp exploits in the future! [19:52] <+MikeMason> cheers and good night! [19:52] <~Dan> If you’ll give me just a minute more, I’ll get the log posted and link you.